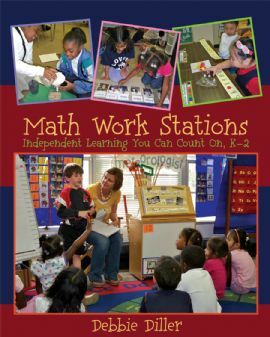 I'm excited to be learning more about Debbie Diller's book, "Math Work Stations." I read it a few months ago, but now I want to see how others are actually putting her ideas into action. I'll admit I'm more of a "center" gal than a "work station" gal. I have always loved teaching with a theme. My biggest fear with using work stations is the children will get bored with the same activities for several weeks at a time. I can't wait to see how others are implementing Debbie's ideas. I'm really hoping to learn a lot this summer-- thanks to all of you. On a different note, this year I made a lot of changes to the way I do math, and I LOVE it! I've devoted much more time in my day to student hands-on practice and my kids LOVED it! My team decided to use our "assigned" curriculum, Everyday Math more as a tool than the Math Bible. It's been more work for me to supplement (a whole bunch) but it really paid off. I'm linking up with with Mrs. Wills for Chapters 1 and 2. 2. Materials do not change weekly, but rather to reflect the students' learning objectives: No- my materials change each week. They are created to reflect their needs, and often they are the same activity with a new look. 3. All students go to stations daily: Yes!! 5. The teacher observes work or meets with groups- Yes!! I wish I had some pictures to share, but my room is packed up for the summer. I love to keep things organized. Unfortunately, my room is very tiny, and it doesn't offer a lot of space for anything extra. 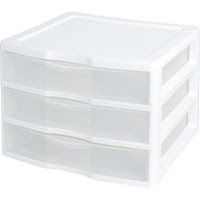 I use the white plastic three-drawer systems to store materials for each month. Each drawer is labeled with a month. I have 4 sets stacked together in a tall cabinet. I use binders to store all of my teacher masters (for all subjects). I put the originals in plastic sleeves and it makes things so easy to see. Binders work SO MUCH BETTER than files in a filing cabinet. I have one shelf for manipulatives. I really had to purge and get down to what was really needed/used because of the lack of space. I use the Sterilite tubs (that hold 8.5 X 11" paper) for the materials that my kids are using each week. They are labeled "Tub 1", "Tub 2", etc. Thank you for linking up with us! I love those 3 drawer files! I'm with you on the differentiation! I hope to focus on this during our book study!